A number of liberal groups and churches are pushing a national walk-out off fast-food employees to demand that the minimum wage be upped to $15 an hour. Forgetting for a moment that fast-food jobs, while having the potential for advancement are usually used as nothing more than stepping stones to a more lucrative career, and for that matter, the only people who will be punished are the franchise owners who are in essence small businessmen and women, will these tenderhearted folks express the same commitment to rage when it comes to that great golden calf referred to as Obamacare? While the self-righteous leftist are venting their collective spleens on McDonalds, Wendy’s, Burger King, Taco Bell, Sonic, and whatever brave souls decided to try to start a business in 21st century America, maybe they should turn their attention to the Great State of Illinois. Its hiring you see. The clock is ticking down to the time that Obamacare will explode across the nation like pus from a lanced boil. (Provided your boil is approved by your IPAB.) Illinois is in the midst of a hiring crunch. Seems they need about 800 temporary workers to sign up the unwitting and unwilling for Obamacare. Given the fact that UPS and now the University of Virginia are slashing employee health benefits, with more to follow soon, I am sure, the Land of Lincoln can use the help. Incidentally, about 15 thousand spouses from UPS will be hunting for healthcare. The good news is that they only have about 180 positions filled. 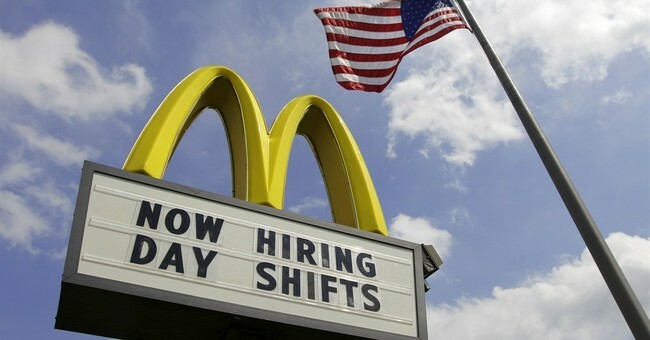 So, anyone in Illinois who needs a part time job can shoot right down and apply. And that could soon be any one of you, by the looks of things. On a happier note, the good folks at Health and Human Services have hired 86 people to serve as Obamacare detectives. (Why is it always the Daily Mail in London that picks up on this kind of stuff?) I’m not kidding. These gumshoes will make sure no one is violating the law, which ought to keep them pretty busy since the thing is 2,700 pages. I imagine people will be breaking laws left and right without knowing it. But ignorance of the law is no excuse. After all, they passed it; you ought to know what is in it, citizen. But I digress. There are a couple of obvious questions. One: How much does this cost? Well, the Mail reports that the people on the low end will be bringing in about $51,800. Top investigators will gross around $89,350. Keep in mind; those were the wages when Obama signed the bill in 2010. The bill also authorized HHS to hire these folks. The total cost of everyone hired by HHS under Obamacare? That would be $138.8 million dollars per year. And that is in 2010 dollars. It almost makes $15 an hour look reasonable for flipping burgers. The other burning question is who will these investigators investigate? And what will you do that might trigger an investigation? Well, I imaging since this bill is rife with opportunities for fraud and graft, they will ostensibly be researching those sorts of things. And unscrupulous people have been taking advantage of the morass of regulations to fleece people. But will they also investigate the people who under-report or over-report their incomes to either maximize their benefits or avoid landing on Medicaid? That number is probably going to skyrocket next year. But since we are still finding out what is in the bill we really don’t know what these people can investigate. Your guess is as good as mine. One thing is for certain- Democrats and complicit, “Air quotes Republicans” passed this bill, one that the American people don’t want. And that bill has a life of its own, and its own police force to boot.